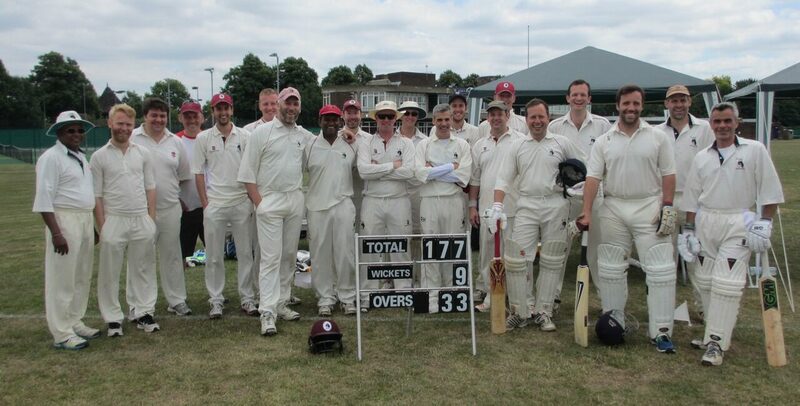 On Sunday 8th July, the Whalers travelled up North again to face the cricketing might of the Octopus. After Big Al lost the toss, the Whalers were inserted on a pitch which looked a little on the green side (for a change). Our early fears were dispelled by some resolute buffet batting by Dan Osgood and, following Adrians dismissal, by debutant Stuart and Adam, back on form with some lusty blows. As the bowling deteriorated further (scarcely possible I know), the runs were flowing freely and the Whalers began to anticipate a good afternoon in the pub. Alas this proved premature. Following the late arrival of Wasim for the opposition, the bowling was rapidly transformed, the runs dried up, and, as time began to work against us in building a winning total, wickets fell. Not even Nelsons newfound technique could hold out for long and the Whalers finally crawled to a total of 168 all out before enjoying their tea, still confident of victory. resistant to fall, with survival and a draw the clear game plan of the slippery Octopus batsmen. Gary Mac made a couple of breakthrough’s, and Oz roughed them up a bit with some short stuff, but wickets came slowly and time was running short. The inspired bowling change which brought Adam into the attack quickly brought victory back into sight, but the jug avoidance which left Adam battling it out with Dan for the man of the match award, the stubborn batting of Wasim and the dropping of a regulation catch by Oz left the flurry of late activity in vain, as Octopus held out for the draw their negative tactics so little deserved. The Whalers retired to the bar to reflect on a moral victory but disappointing result, and to fine Oz to oblivion. With the troops heavily depleted, the Whalers travel to face Wandham on Sunday for a sure to be spicy encounter with the treacherous Mr Williams, stripped to the bare bones of the squad by injury and vacation and desperate for victory against the odds. May the force be with us!